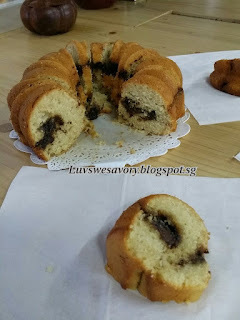 Have been cracking my head ... what cake to bake for Father's Day celebration at home. My hubby loves beer and coffee (well, most guys do ... don't they? hee.. hee !) ... Obviously, I can't bake a "beer cake". He didn't like too sweet and creamy cakes either. 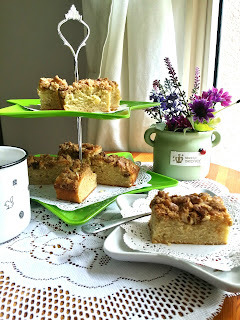 My previous bakes coffee walnut loaf and cranberry coconut streusel muffins. 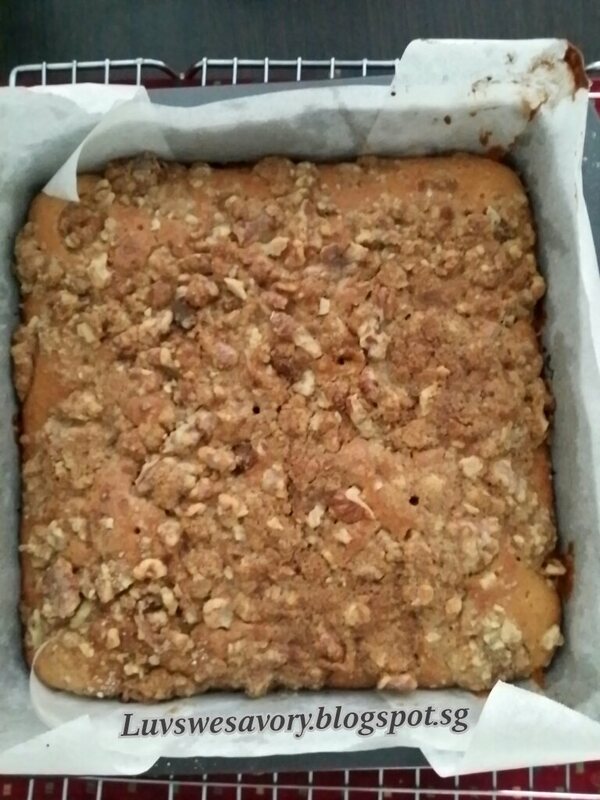 So, a simple Coffee Walnut Streusel Cake it is ! A few days ago, I baked a Coffee Cinnamon Chocolate Chips Bundt Cake for breakfast with my colleagues. A yummy recipe I tweaked from here. I liked the texture and glad that it was well received by most colleagues. 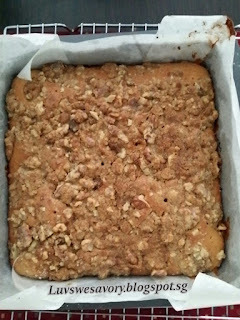 So I adjusted the recipe a little (cos realised didn't have any yogurt) and added streusel toppings to bake a coffee walnuts streusel cake. 2 tablespoons instant coffee mixture (dissolved 3 teaspoons Nescafe instant coffee in 2 tablespoons hot water, cooled). Preheat the oven to 170ºC. Position the rack in the middle. The temperature of the oven may vary, do adjust the temperature and timing to suit your oven. Make the streusel ingredients (D) : In a large bowl, whisk together flour, light muscovado sugar, ground cinnamon and walnuts. Cut the butter into the flour mixture with either a pastry blender, your fingertips or two knives until it resembles coarse crumbs. Cover, and refrigerate until ready to use. Line and grease the base of a 8x8-inch square cake pan with parchment paper. Lightly grease the sides with butter. In a clean mixing bowl, beat together the butter, castor sugar, and salt until light and fluffy using an electric mixer on medium speed. Add the eggs one at a time, beating well after each addition. Scrape down the sides and bottom of the bowl as needed. With the mixer on low speed, add alternately the ingredients (B) flour and ingredients (C) milk & coffee. (flour mixture in three additions) and milk & coffee (in two additions) [starting and ending with the flour mixture]. Mix only until just combined. Pour batter into the prepared pan and smooth the top with spatula. Dot or spoon the streusel evenly all over the batter top. Tap the pan lightly on a table top a few times to get rid of any trapped air bubbles in the batter. Bake the cake in preheated 170°C oven for 40 minutes or until golden brown. *note: you may tent it with aluminium foil if it gets browned to quickly. To check for doneness, insert a skewer or toothpick in the center of the cake if it comes out clean with a few moist clumps clinging to it. Let the cake cool in the pan for 10 minutes before removing top-side up, onto wire rack to cool completely. Well, we have them warm with hot coffee! 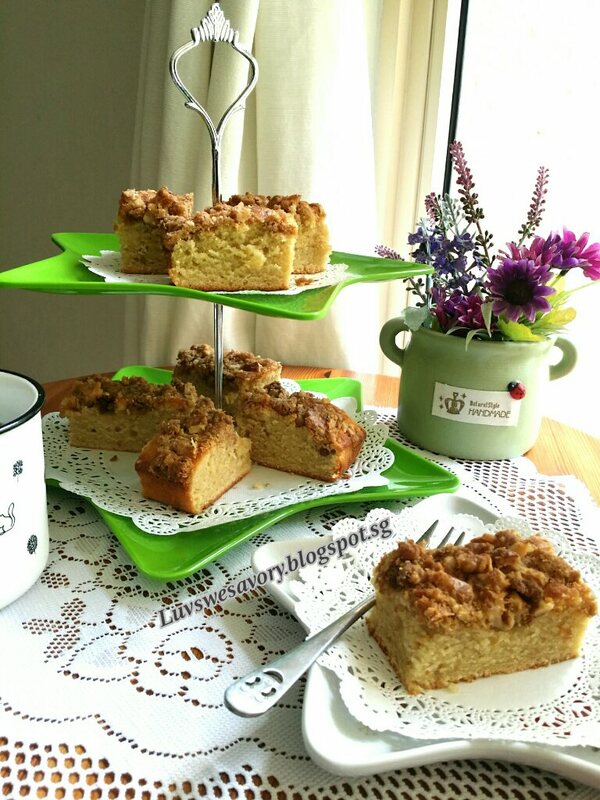 It is a soft with tender crumbs, not too buttery cake. 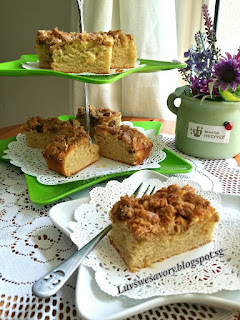 The streusel crumb topping is an addition ... crunchy, sugary crusty with a hint of cinnamon fragrance. Be it a celebration cake or not, we simply enjoyed this simple cake. Happy Father's Day to my hubby and all daddies out there ! Hi Karen, what a delicious and beautiful cake you made for your husband. Love your presentation and pics, very nice. Hi this cake looks yummy. I would love to try out. However I don't understand the streusel part. What do you mean by 'cut the butter into the flour mixture? Is it add the butter cubes into the flour mixture and stir or just spread on top? Do I have to wait till the butter melt? Thks so much. The chilled butter cubes are still pretty chucky. So when added into the flour, need to cut the butter into much smaller pieces, mixing and binding till course crumbs texture. Then sprinkle or spoon the streusel mixture onto batter top. No, you don't have to wait till butter melt. Hi Karen, I love streusel cakes, it adds a nice crunch to a soft and moist cake. Your cake looks good and delicious! Lovely cake! 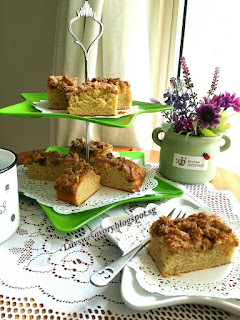 The addition of the streusel sounds good! Yum yum! I love streusel topped cakes!